Visual designer Charis Tsevis creates high-impact images by piecing together digital minutia into stunning mosaics. 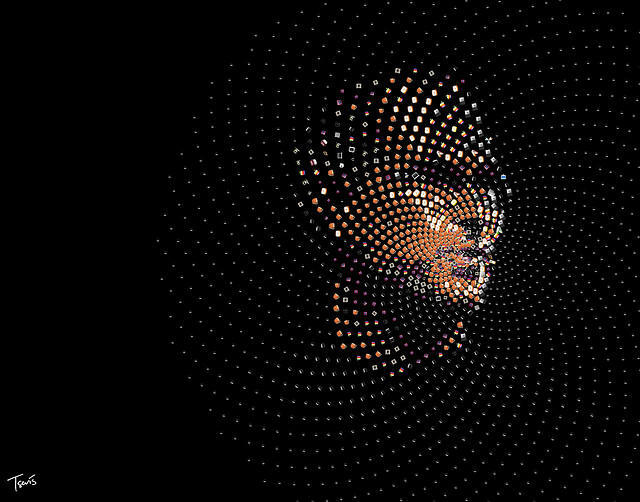 Tsevis, based in Athens, Greece has worked for Toyota, IKEA, Bradesco Bank, Saatchi and Saatchi, BBH and media like Time, Fortune, Los Angeles Times, Sunday Times and Forbes, to name a few. These odes to Apple can sometimes take a week or so of 16-hour days to put together — it’s the kind of work only a Cupertino fan could love. Cult of Mac talked to Tsevis about how he got started, getting the portraits into T-shirt form and his favorite piece of Apple technology. 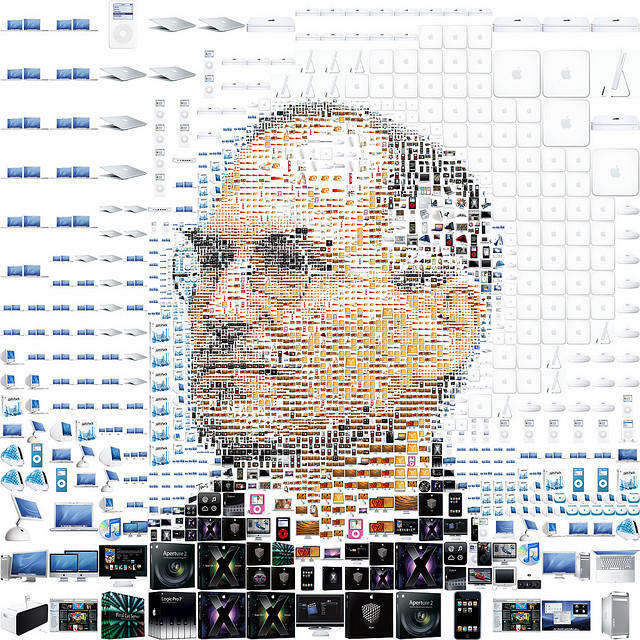 Cult of Mac: How did you get started doing mosaics? Charis Tsevis: As long as I can remember, I’ve worked with complex images. I’ve always loved the fractal complexity of nature and the rules that I could discover behind superficial chaos. At the same time I’m amazed by industrial aesthetics and discovering that there is a kind of poetry in machines. I fell in love with machine art before I even had a computer and when I did finally get one, it was a only natural to start playing around with art forms like ASCII Art, TypeArt and fractals. I think mosaics came as the next instinctive step in this development. CoM: What’s the fascination for you with Apple? CT: I kind of feel as though we are living in an Apple world, even if it’s not always conscious. 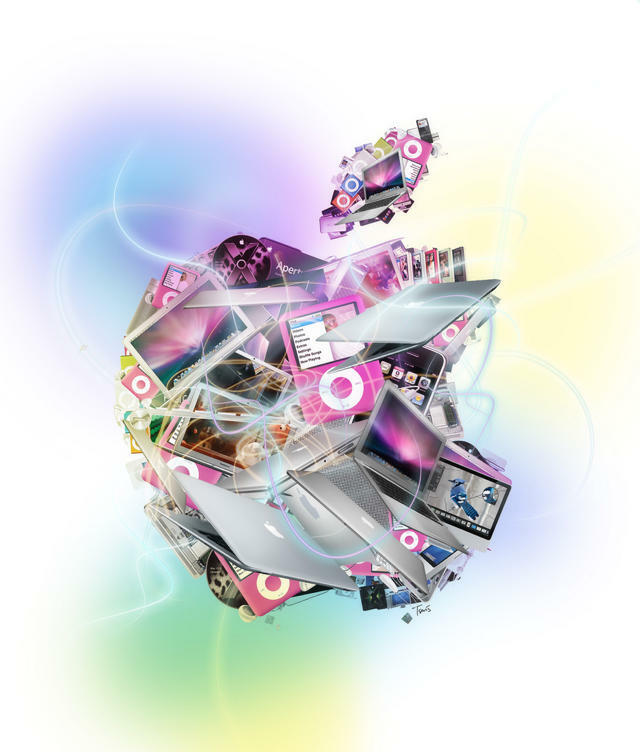 Apple made a considerable contribution to bringing technology and computing power to creative people from every profession and discipline as opposed to it being previously accessible only to technologists and geeks. It has been much more than a simple company. It has been a way of seeing technology. Apple transmits the direct reflection of the liberal movements of the West Coast and the projections of their values in today’s wired world. All these ideas have had a massive impact on our world and today, every computer is somehow a Mac (and more recently, every smartphone is somehow an iPhone too). I also find it so intriguing that Steve Jobs and his team continue to find countless ways to reinvent technological tasks and to integrate them into our daily lives. You can like them or not, but it’s not possible to deny that these guys have produced great things with a lot of passion. I think it’s this passion and these liberal values that have been the focus of my fascination with Apple since the early 80s. CoM: What’s your work set-up like? CT: I have been a Mac user since the late 80s so I’ve always had, and still have, many set-ups that slowly become part of my small Apple museum. Since 2000, I’ve always worked with two Macs at a time. A Mac Pro (or PowerMac before) as my main design tool, and a Mac Book Pro for browsing and communicating. I also use my iPhone on the road and my iPad in bed. CoM: What mosaic subject do you hope someone will commission? CT: Hmm…I don’t know. What I really want is to be surprised by a client or colleague. Something exotic, something political or something just personal. CT: Absolutely! People ask almost every day for prints or T-shirts. 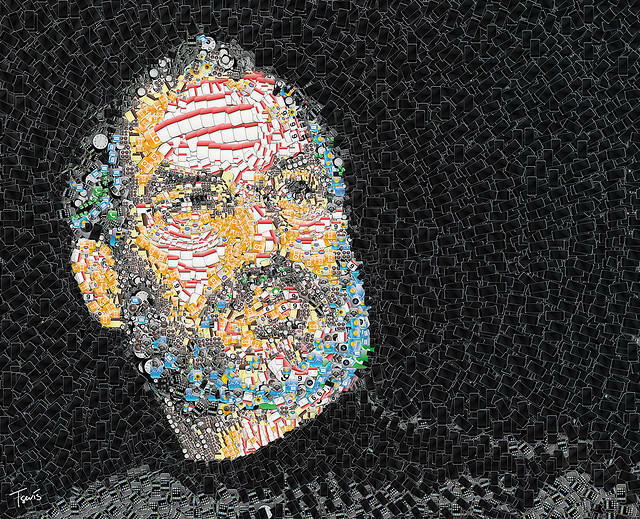 Some of my work however, like the Steve Jobs’ mosaics, cannot be sold for copyright reasons, but I’m planning to make my other designs available soon. A concern that I have is that I’d like to find a service that would allow me to offer high- quality art prints using the best inks and paper at reasonable prices for my clients. I have considered setting up a complete print shop for this in order to guarantee the quality and to sell signed prints, but I haven’t made it a priority yet. I guess I’m still looking for the right service for my work. If you have suggestions let me know. CoM: What Apple product would you want on a desert island? miss all my other Apple stuff. CoM: What’s next for you work-wise? CT: As I mentioned previously, I like to be surprised with my work. This is the best part of being a freelance designer. People come and propose such great ideas and projects. So I prefer not to have a set image in my head of what’s next. I just hope I’ll continue to be amazed with these exciting design proposals.